Tacos Para Justicia (Tacos For Justice) is a grassroots campaign to bring awareness to the issue of responsible Immigration reform. Participating taco trucks in Los Angeles will be donating $.50 to $1 to the Immigrant Justice Advocacy campaign when presented with a coupon provided by Tacos Para Justicia. You can download a coupon from the Tacos Para Justicia website and view a list of taco trucks in LA that are participating in the campaign. The goal is to raise $250,000 for pro-immigration reform proposals in Congress. 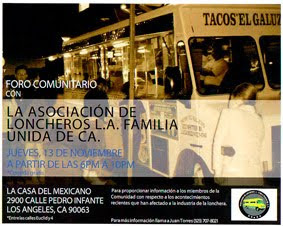 Show your support by downloading the coupon and visiting participating LA taco trucks.